This weekend is one of the rare weekends where I'm back in Amsterdam, with no trips nor big upcoming weekday events planned. I love these weekends at home where I can just potter around, veg out and chill. I usually start these off by heading to the organic farmers' market, Noordermarkt, on Saturday morning. You can really feel the changing seasons just by the produce available at the markets - loads of squashes, pumpkins, and all varieties of mushrooms are popping up everywhere. Autumn is definitely in full swing, even if we're still having unusually warm weather for this time of year! This is one of my favourite stalls at the Noordermarkt - the mushroom seller. These guys have all manner of mushrooms all year round, and this weekend they had the GIANT FUNGUS INVASION. These babies are about the size of two human heads. Woah. Here are some ways I try to speed things up in the kitchen at the weekend for later in the week. It may take a little prep time initially, but once you get into the swing of it, the couple of hours that you spend prepping or cooking during the weekend could actually save you loads of time during those busy weeknights when you've come home late or can't be bothered to get a whole meal going. I find this helps me stay away from ordering the all too-easy takeaway meals. The first thing I do after these market trips is get straight to work in the kitchen - herbs and green veggies are washed and dried, and usually fresh herbs like parsley and coriander last longer if you wrap them up in a paper towel, then ziplock them in your bottom fridge crisper. I do the same with salad leaves like spinach, rocket or dandelion greens. This way, my morning green smoothies are much faster to make when all I need to do is reach into the fridge and grab handfuls of fresh, clean, pre-chopped veggies. I've also washed and pre-chopped everything from celery, to carrot sticks and bell peppers - These should be stored in ziplock bags, tupperware or glass jars. Whatever makes your life easier later, that's the whole point of this exercise. Cooking stuff in batches is also another way to save time later. You can do this with stuff that takes a long time to cook, like beans. I don't like canned beans as they tend to be soggy and also lose most of their nutritional value. If using dried beans, they can be soaked overnight then cooked the next day. Grains like quinoa, buckwheat, brown rice, etc. can also be pre-cooked and stored in mason jars for later in the week. It's much easier to throw these into a quick mid-week salad, for example, rather than having to waste time cooking stuff just to assemble what should be a fast and easy meal, like a salad. This weekend, I roasted 3/4 of a butternut squash. The other 1/4 I'm saving to eat raw - I'll turn this into a raw "butternut noodle" using the spiralizer later in the week. 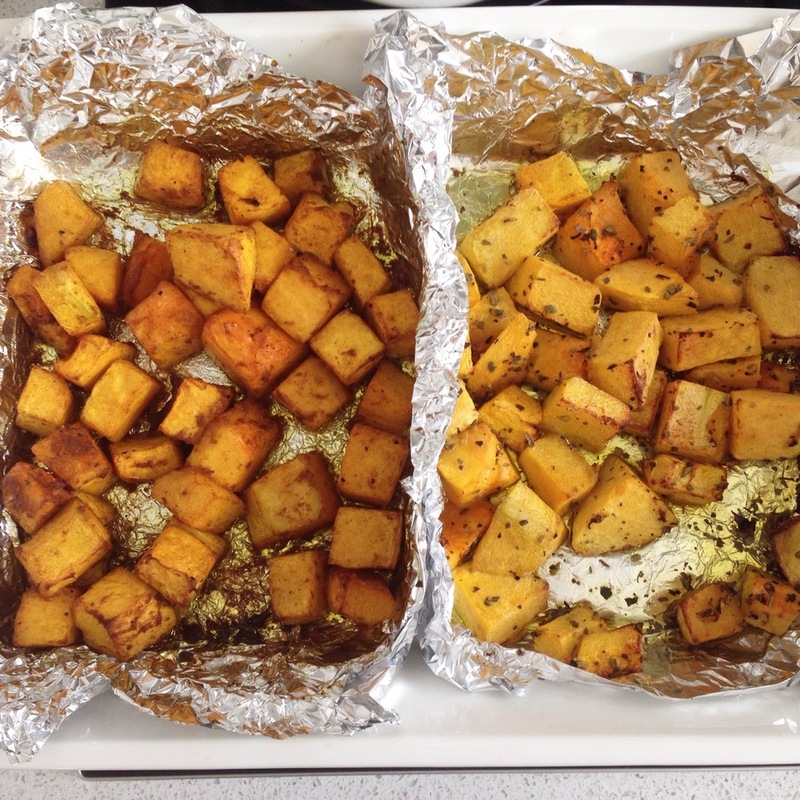 I'm not really a meal planner, and tend to be quite ad-hoc in my approach, so I figured I'd turn the other 3/4 of a squash into two different flavours: one is a warming recipe roasted with cinnamon, turmeric and maple syrup, the other is a fresh and crisp recipe roasted with sage and olive oil. I can easily turn either one of them into a soup later in the week. They can also be added to salads, pastas, or turned into a side dish. I didn't put measurements above, as you should add according to taste, depending how much squash you use. I also batch cooked some quinoa and wild rice - just added some himalayan sea salt to both, and cooked the quinoa with a bay leaf. It's easier to batch-cook these without any added flavours first, then add herbs/ spices later, once you've decided what kind of dishes you'll incorporate them in. These will be stored in the fridge, but any of the above can also be stored in the freezer if you're not planning on eating them in the first few days of cooking. These are just some ideas to help kickstart you into semi-planning healthier midweek, home-cooked meals. These are my tried and tested experiments, so while they work for me, they may not necessarily work for you. If you have some other life hack for meal preps to help you save time during the week - please share them with us in the comments section below!